Gov. Dannel Malloy cancelled plans to provide $300,000 in borrowed state money to a New Haven nonprofit with links to the Communist Party USA after military veterans shared their opposition. Previously, members of the Malloy administration had made comments supportive of the funding for the New Haven People’s Center, including senior advisor Roy Occhiogrosso and Office of Policy and Management Secretary Ben Barnes. The center is run by officials in the Connecticut chapter of the Communist Party USA and hosts the Connecticut bureau of People’s World, the party newspaper. The administration received its first warning about the project from a retired state employee who previously oversaw grant funding from the Department of Social Services. 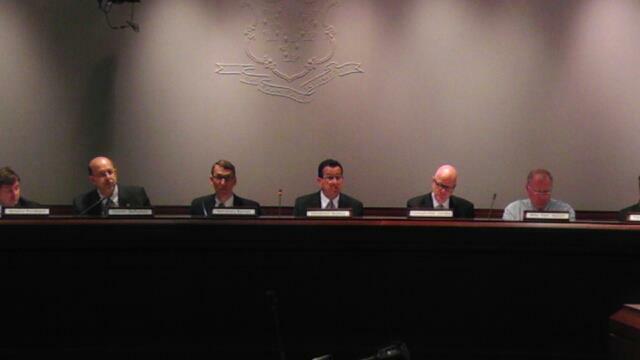 If Malloy allowed the commission to approve the funding, it would have come from DSS. Veterans hospitals deserve government money more than Communists do, declared Mike Rogalsky, who served in an Army hospital evacuation unit in Vung Tao, Vietnam, in 1968. He called Malloy’s support for the People’s Center a “total disrespect to any and all veterans who have fought” Communism. Gov. Malloy chairs a meeting of the State Bond Commission. “I’m concerned about the amount of controversy that this has caused particularly for them, with respect to those individuals who have served this nation in the armed services,” he explained. “But ultimately what that represents to people who served in various conflicts, you know, became a concern,” Malloy said. Sen. Len Suzio, R-Meriden, who spoke at the demonstration, congratulated veterans Monday on their ability to change policy. VETERANS ARE CORRECT IN THEIR PURSUIT OF DIGNITY AND FREEDOM. WELL DONE. I see our brave men and women in uniform don’t stop fighting for our freedom once they’ve returned and donned civilian attire.. Gotta begrudge a little credit to Malloy for doing the right thing and backing down – albeit under some pressure. MANY THANKS to all veterans and those who stood with them. We are grateful always to your commitment to us and our Country. God Bless. Hooray! Democracy prevails over the commie freeloaders and parasites. It always does. Thank you Tom Scott, thank you veterans, thank you CT Law Tribune columnist Karen Torre, thank you Journal Inquirer Editor Chris Powell, thank you GOP state reps and senators who came out, thanks to all decent Americans who worked to stop this communist theft of vetarans’ and other’s hard-earned tax dollars (in comparison to commies, who hardly ever work, never mind contribute to the state treasury)!